Nicknamed “Spider”, and son of a policeman, he spent the early part of his playing career in junior football in Londonderry, but it did not take long for his talent to be spotted, and at the tender age of just seventeen Derry Institute captured his signature. He was about to sign for Linfield when Frank Scott-Walford, on one of his many recruitment drives in Northern Ireland, persuaded him to turn professional with Leeds City in May 1910. 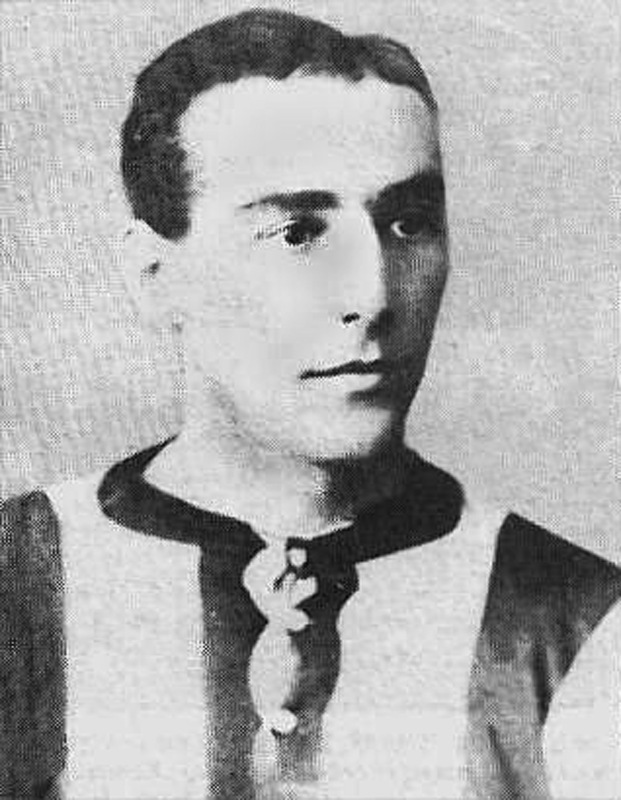 He was at Centre Forward in his first season at Leeds and went straight into the first team as City’s star striker Billy McLeod missed the first game. He was omitted for the next two games as McLeod returned to the main striking role. City were well supplied in the three cental forward roles and for fifteen straight games Billy McLeod was at Inside Right, Gillespie at Centre Forward and Joe Enright at Inside Left, with Mike Foley and Tom Mulholland the unlucky players. However, Gillespie only managed two more games as Billy McLeod took over the Centre Forward duties and Tom Mulholland came in at Inside Right for the rest of the season. He started the following season at Inside Left as Joe Enright was injured and missed the first game. It was Mulholland who gave way for two games and then Gillespie got the Inside Left spot as Joe Enright covered for the injured Fred Croot on the Left Wing in the next game. He had to wait until the start of December before he was called upon again for two games when Fred Croot had to drop out. They were his last games for City as Sheffield United signed him for a bargain £500 in December and it soon became apparent that City had made a big mistake in parting with the talented Irishman. He went on to become Sheffield United’s most capped player, amassing twenty-five International caps for his native Northern Ireland. His first cap came in 1913, his two goals giving Ireland their very first victory over England. In 1914, he was a part of the Ireland side that won the British Home Championship outright after gaining wins over England and Wales and a draw against Scotland at Windsor Park. Gillespie is one of three players to have scored seven goals against England. He held the record for goals scored for Northern Ireland for seventy-eight years, with thirteen goals. It was equalled by Portsmouth’s Colin Clarke in 1992 but it was not until 2004 that it was finally broken by Leeds United’s David Healy. He spent seventeen seasons at Bramall Lane and gained an FA Cup winners medal in 1925, when the Blades beat Cardiff City 1-0 in the Final. A fierce looking Inside Forward, Billy was team captain of Sheffield United between 1923 and 1930, leading United's FA Cup triumph in 1925. He had been denied another FA Cup Winner's medal in 1915 when he missed United's victory with a broken leg, received in the first game of the season against Sunderland on 2nd September 1914. He scored one hundred and twenty-eight goals in four hundred and forty-eight League appearances and scored a further nine goals in forty-four FA Cup games, while with Sheffield United. He returned to Derry and was initially Player-Manager, but after retirement he remained as Manager, of Derry City from 1932 until 1941. He was held in such high regard in his home country that when he left Sheffield United in 1932, his new club, Derry City, changed their strip to red and white stripes in reverence to him and the Blades. He guided them to two City Cup triumphs as well as four successive Irish League runners-up spots. He also led them to the 1936 Irish Cup final where they eventually lost 2-1 to Linfield after the first game had ended in a goalless draw in front of a 23,000 strong crowd at Celtic Park. When he left Derry City as Manager in 1941 he settled in Kent. He died in Bexley Kent on 2nd July 1981, a month short of his ninetieth birthday.